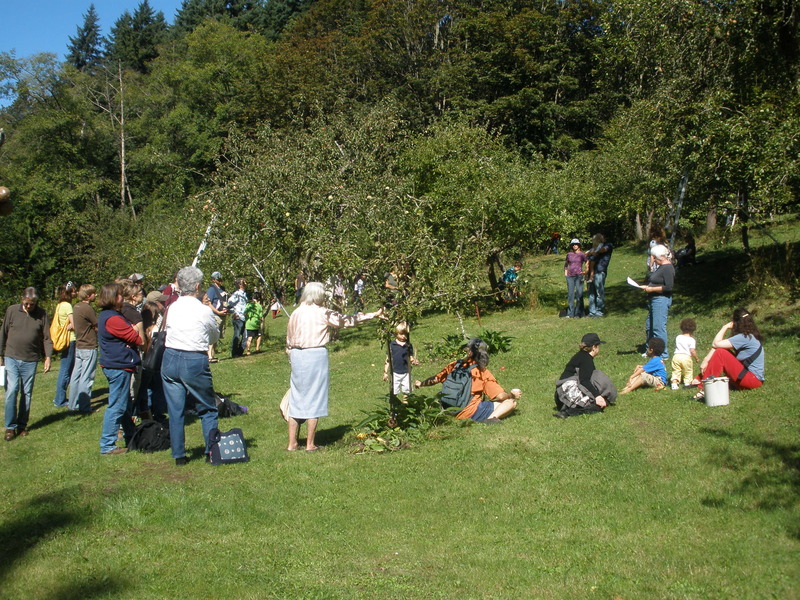 The 7th annual Piper’s Orchard Festival of Fruit is taking place on Saturday, September 14, 2013 at the Carkeek Park Environmental Learning Center and Piper’s Orchard from 10AM – 2PM. 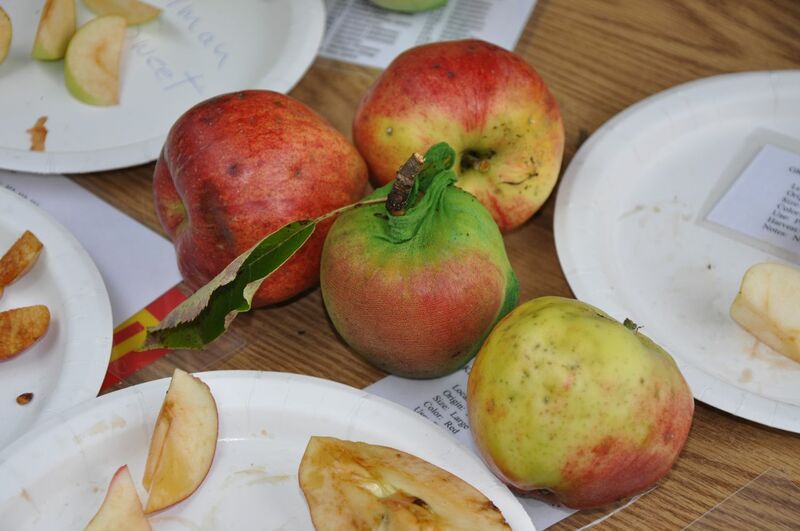 Join us for cider pressing, a pie contest, fruit tree experts, music, kids’ crafts, and more. 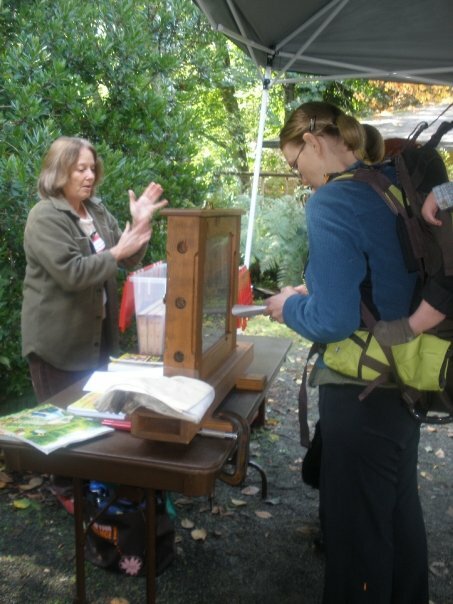 Our keynote speaker is Dr. Beverly Gerdeman, a noted researcher and entomologist from Washington State University. Dr. Gerdeman will share techniques for protecting backyard fruit from damaging insects – including the newly arrived and dreaded spotted wing drosophila. 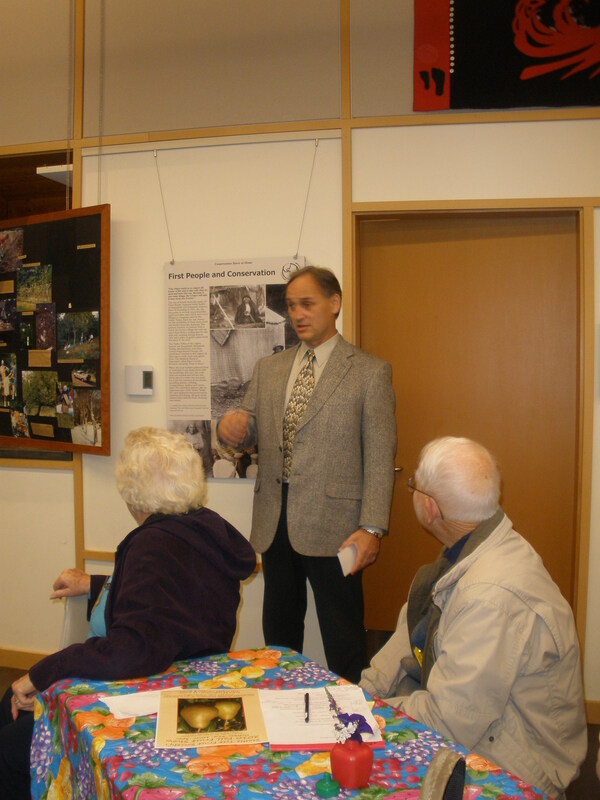 Recognized internationally as a fruit tree expert, Dr. Gerdeman is an engaging and fun presenter. She will speak at 10:00. 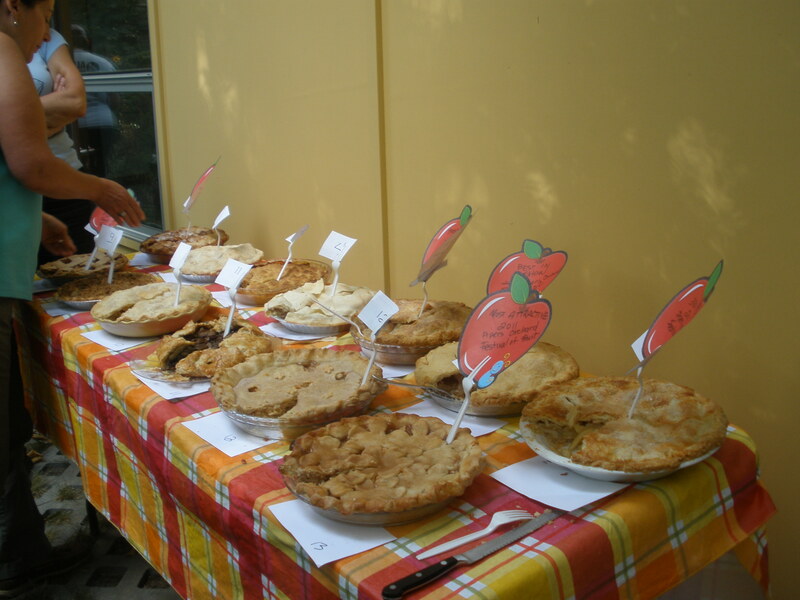 Competitive bakers are encouraged to enter the apple pie contest, with winners taking home prizes. Entries are due at the festival by 10:00. 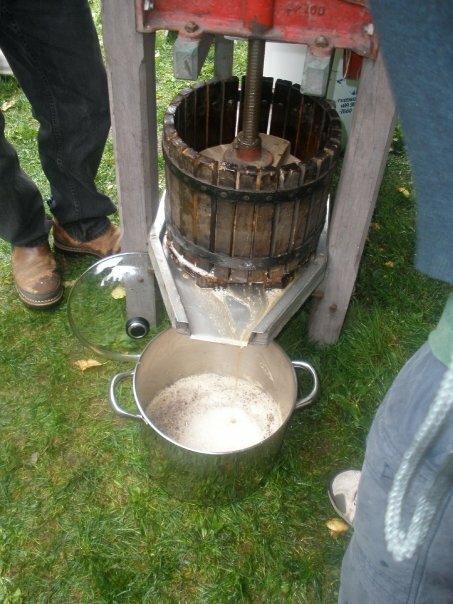 We’ll be pressing fresh cider with a hand-cranked cider press. Fresh warm cider and slices of donated pies will be available from Tillie’s Café at a nominal cost, with proceeds supporting ongoing maintenance of the orchard. Buy a slice when Tillie’s Café opens at 10:30, and another after the pie contest results are announced at 11:45! 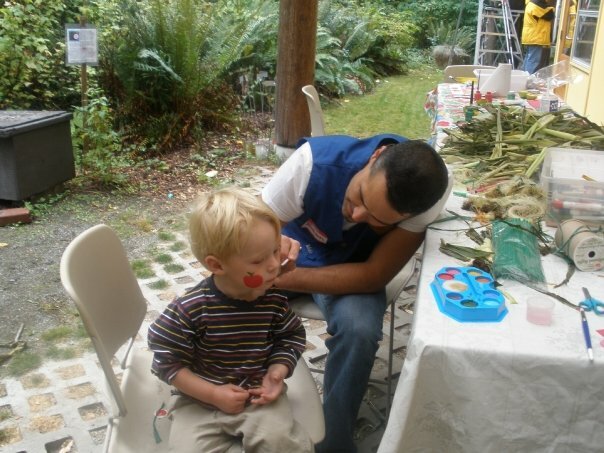 You can taste heirloom apple varieties from the orchard, enjoy live music, have your kids participate in crafts, and visit booths to learn about mason bees, City Fruit, and Seattle Tree Fruit Society. Around 12:45 there will be a guided walk (weather permitting) up to Piper’s Orchard, less than 1/2 mile from the ELC. 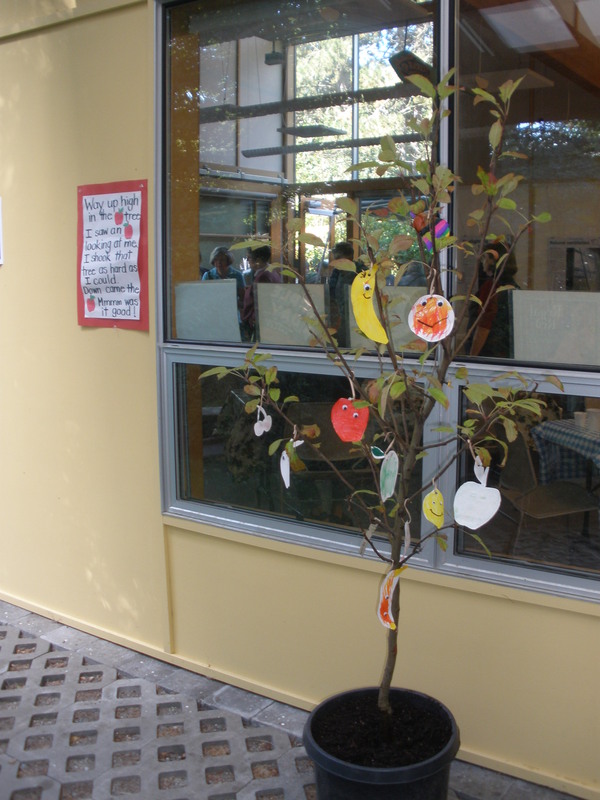 You can learn more about the orchard and see our beautiful apple-laden trees. Visitors are encouraged to park below the learning center. Volunteers will be directing guests. The 2013 Festival of Fruit, which will be held Saturday, September 14 from 10AM – 2PM, will be our seventh annual festival, and will celebrate several anniversaries. 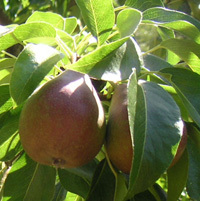 Andrew Piper purchased the land on which the orchard lies in 1888, 125 years ago this year. 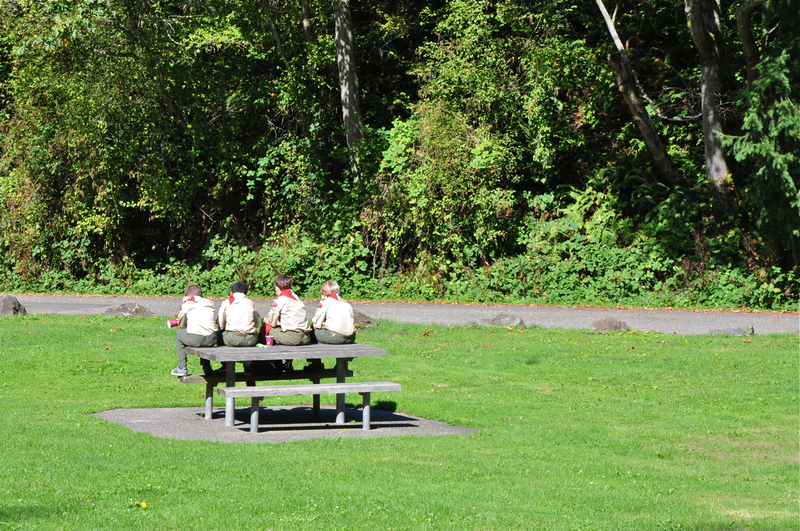 And the present day activities of releasing the abandoned orchard from its blackberry and ivy prison began in 1983, thanks to the enthusiasm of Daphne Lewis, a recently graduated landscape architect, who discovered the orchard while making a master-plan survey for Carkeek Park restoration. We expect this year to be as fun and informative as the previous festivals. Our keynote speaker, Dr. Beverly Gerdeman, a noted WSU researcher and entomologist, will discuss protecting home orchards from damaging insects using organic, biological, and IPM techniques. She will also discuss her cutting-edge research on the spotted wing drosophila, a new pest and one now threatening backyard fruit here. Dr. Gerdeman, who is recognized internationally as an expert, is also a talented speaker. She is smart, articulate, funny, engaging, and an excellent communicator. 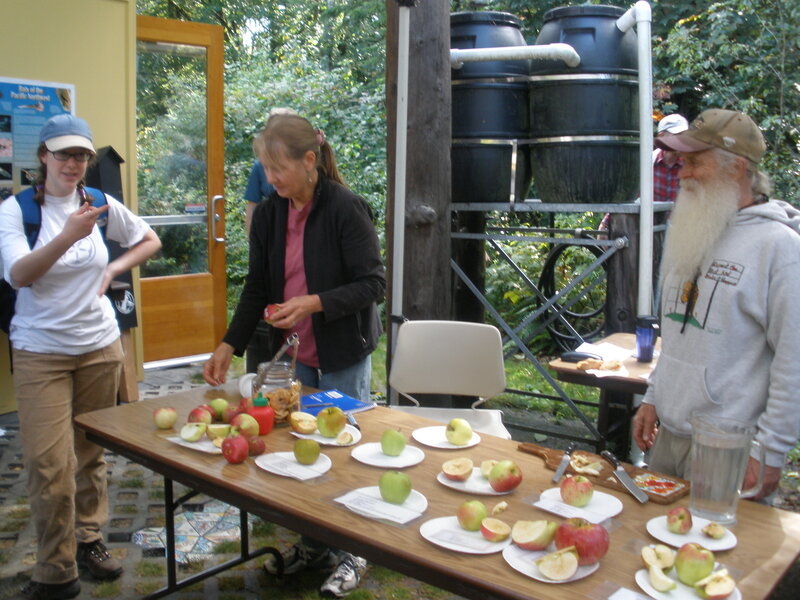 And, as in past years, we’ll be pressing cider, holding an apple pie contest, selling pies and cider, featuring live music, kids crafts, Piper’s Orchard apple variety tasting, and informative booths from City Fruit, Seattle Tree Fruit Society, etc. 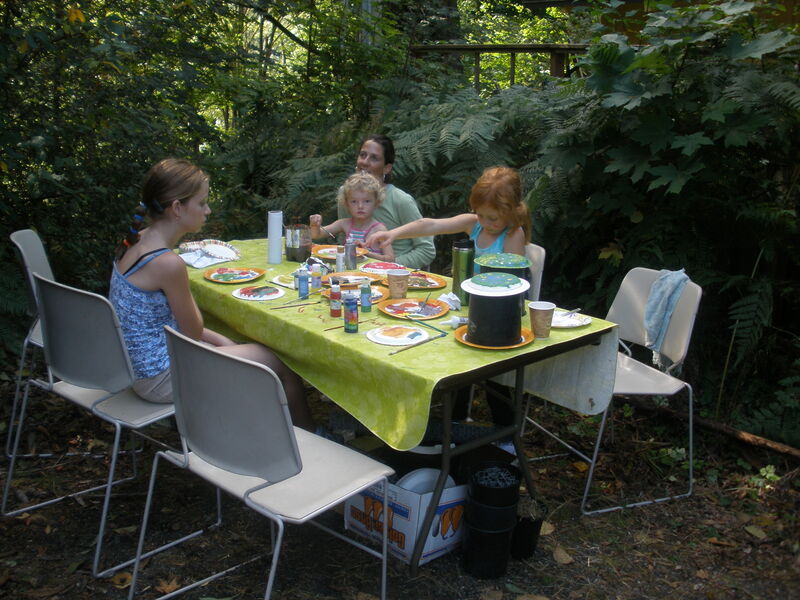 After the morning’s lecture, apple pie contest, and other activities at Carkeek Park’s Environmental Learning Center, you’ll have the opportunity to walk up to Piper’s Orchard, and learn more about the orchard and the Piper family history, permaculture, the grapes we’re growing, and more. Pies and fresh pressed cider sold like hotcakes at Tillie’s Cafe. 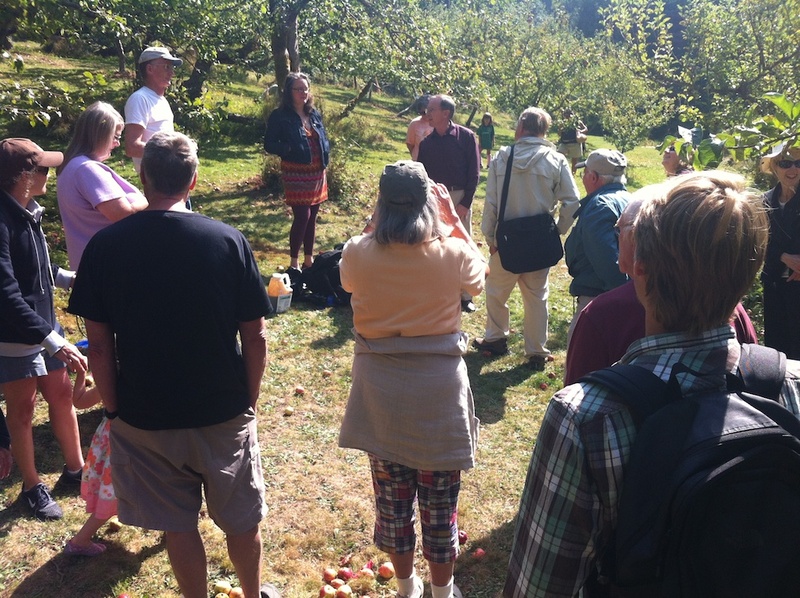 Visitors walked up to the orchard to enjoy the sunshine and learn more about the trees, permaculture, and the orchard’s history. 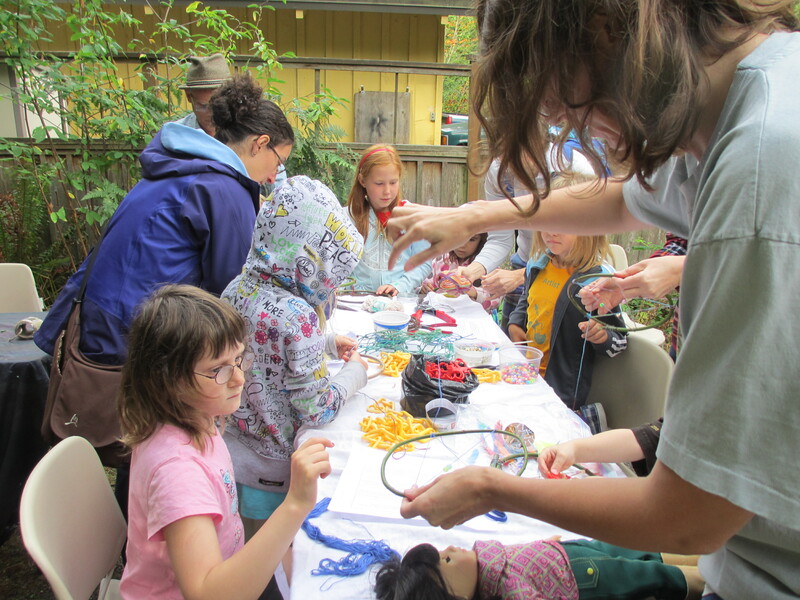 Kids and their parents alike enjoyed making dream weavers, facilitated by artist David Francis. 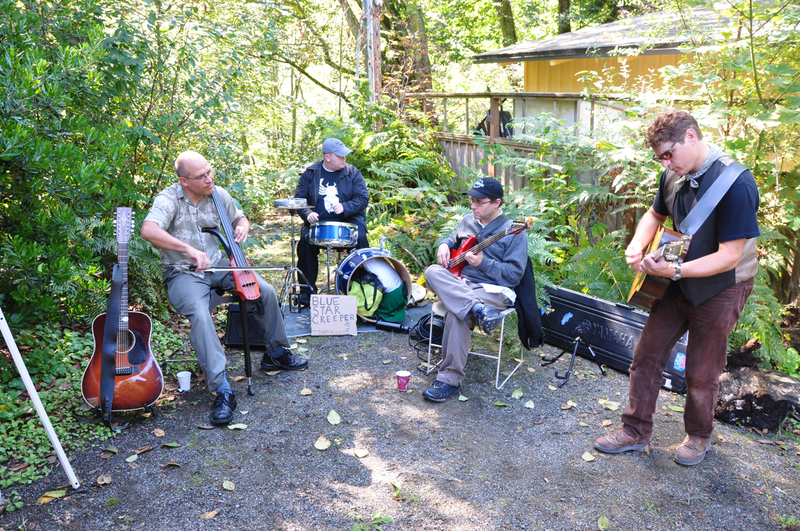 Blue Star Creeper provided music while folks were pressing cider. 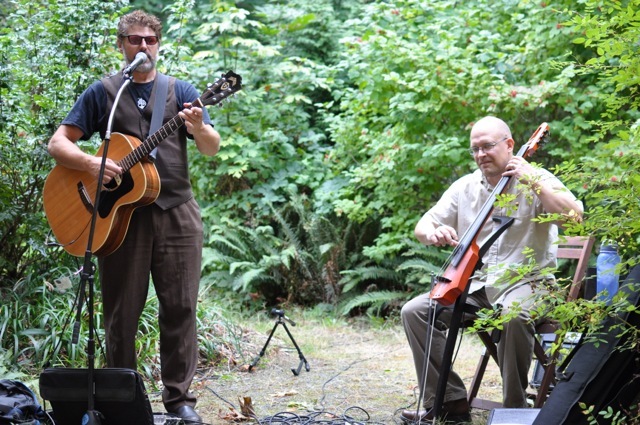 The fifth annual Festival of Fruit and Piper’s Orchard 120th Anniversary a great success! On Saturday, September 24th we held a very successful festival, with over 200 visitors, great presentations, apple cider, apple pie, kids crafts, music and a visit to the orchard. The weather was the best we’ve ever had, in the mid 70’s and sunny. We even managed to make the festival very environmentally friendly, due to a total power outage at the park (and surrounding neighborhood) during the festival. 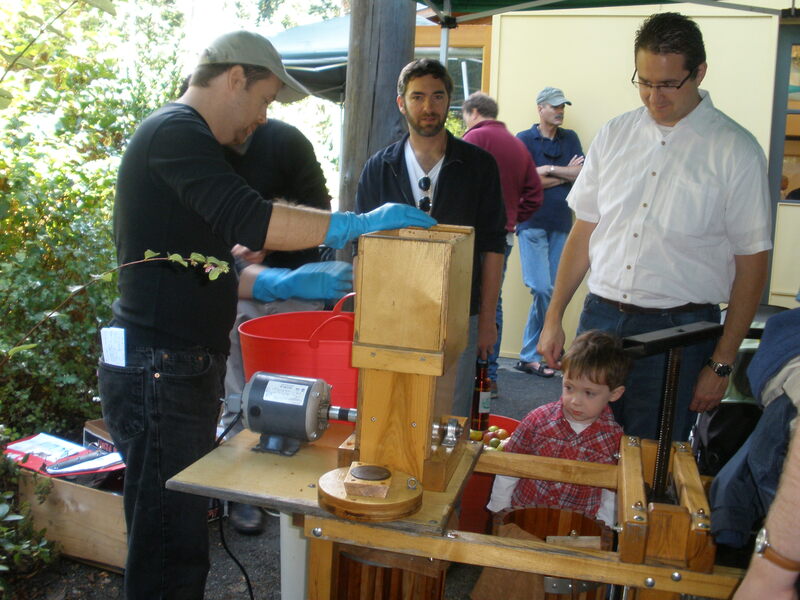 Good thing we had a mechanical as well as an electric cider press! Thank you to all the volunteers who helped make the festival a rousing success. Click here to watch a youtube video about the festival. Susan Dolan, our keynote speaker, is a historical landscape architect for the National Park Service and gave a fascinating talk about historic orchards in America. Susan Dolan illustrates her comments with her book, due to no power for PowerPoint. 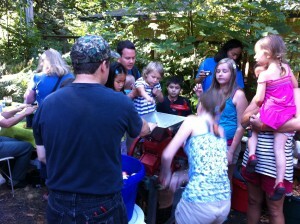 Meanwhile, many hands helped press cider through the mechanical press. 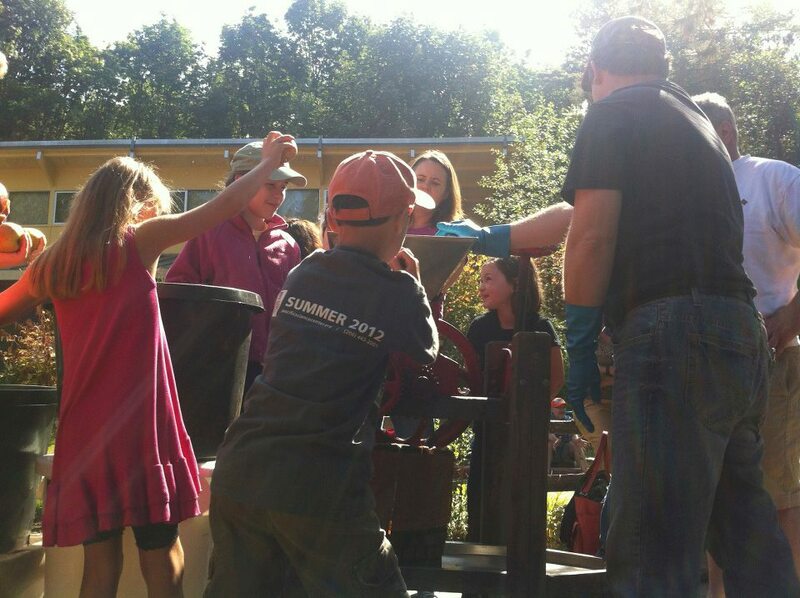 All hands on deck for pressing apple cider. 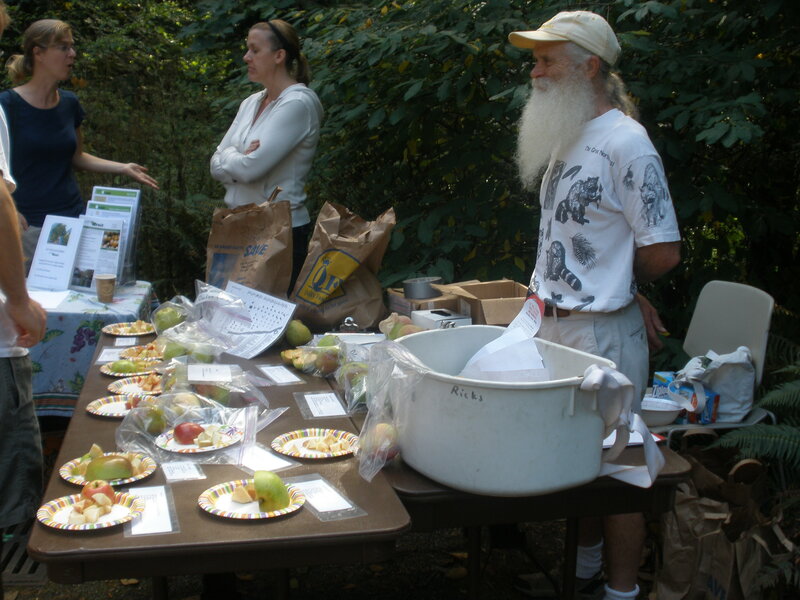 After Susan’s presentation, David Randal Gould, discussed fruit foraging in Seattle. 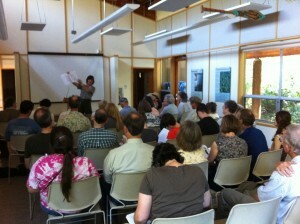 Gail Savina of City Fruit talked about the Seattle Parks orchard stewardship program. 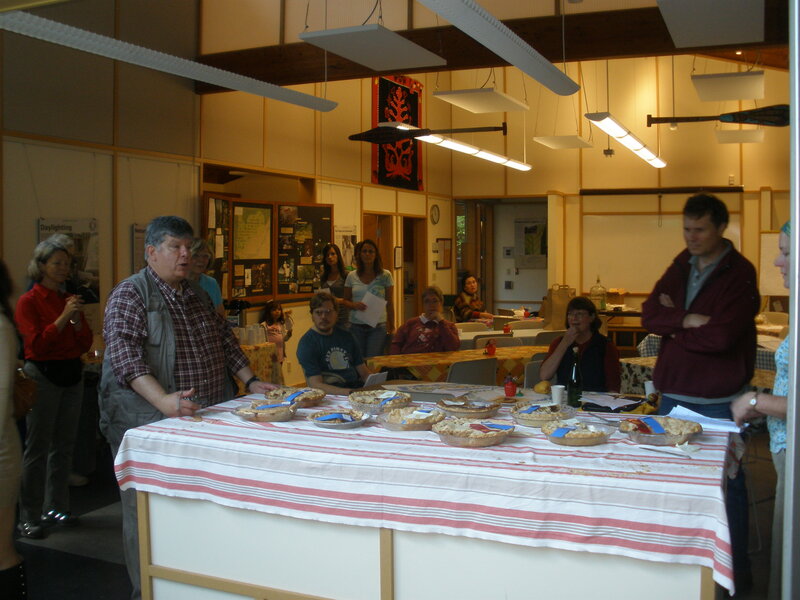 And Ken Workman, a descendant of both Chief Seattle and Jesse Hiatt (who discovered the Hawkeye, which became the Red Delicious apple), described the historic Duwamish tribe diet. Meanwhile, visitors were buying pie and cider at Tillie’s Cafe, apple pies were being judged, kids were making bee houses, music was entertaining the crowd, and visitors were learning the identity of their apples, tasting apples from the orchard, and learning about mason bees and other points of interest. Music hath charms to sooth . . . Kids assembled and painted bee houses. 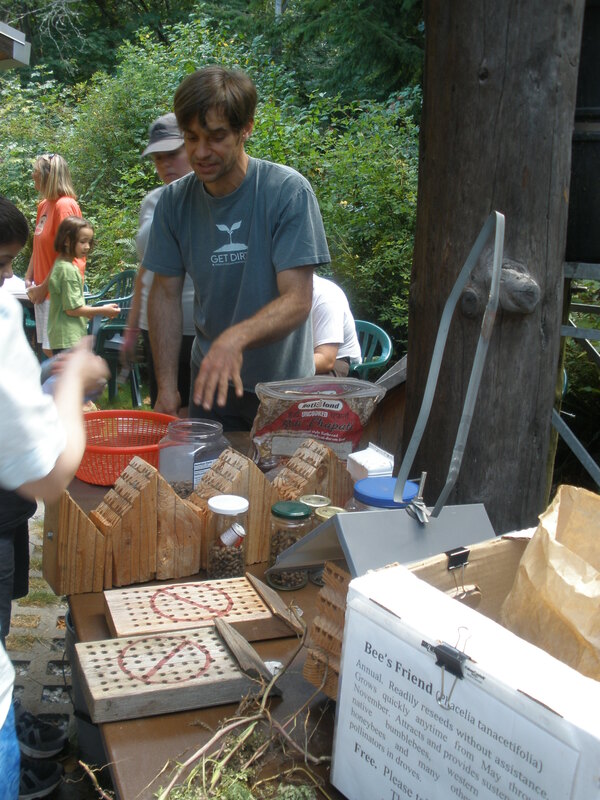 Visitors helped clean out the mason bee hutches. Finally, it was time to announce the winners of the apple pie contest. First prize was a $50 gift card to Swansons Nursery! Then everyone lined up to buy pie. 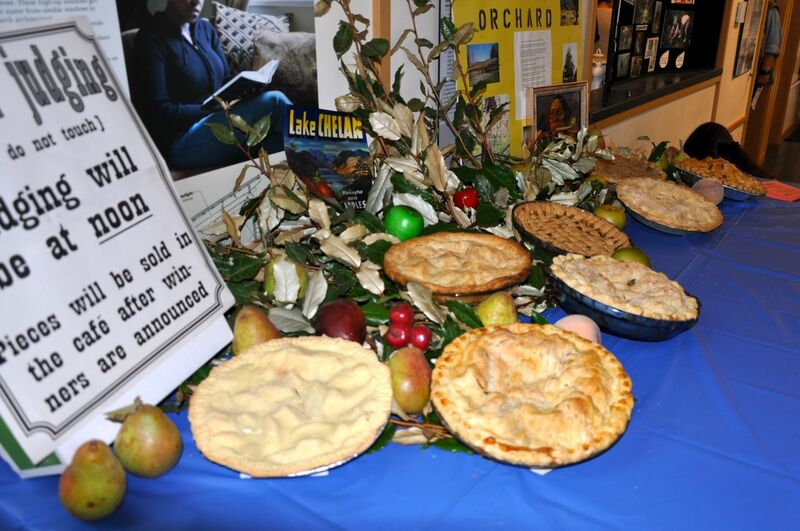 All the pies were great, but there was a grand prize winner, made with apples from Piper’s Orchard! In the afternoon, many visitors head up to Piper’s Orchard, where they learned about orchard history, the heirloom variety grapes growing there, permaculture, and organic pest management. The orchard was in fine shape. 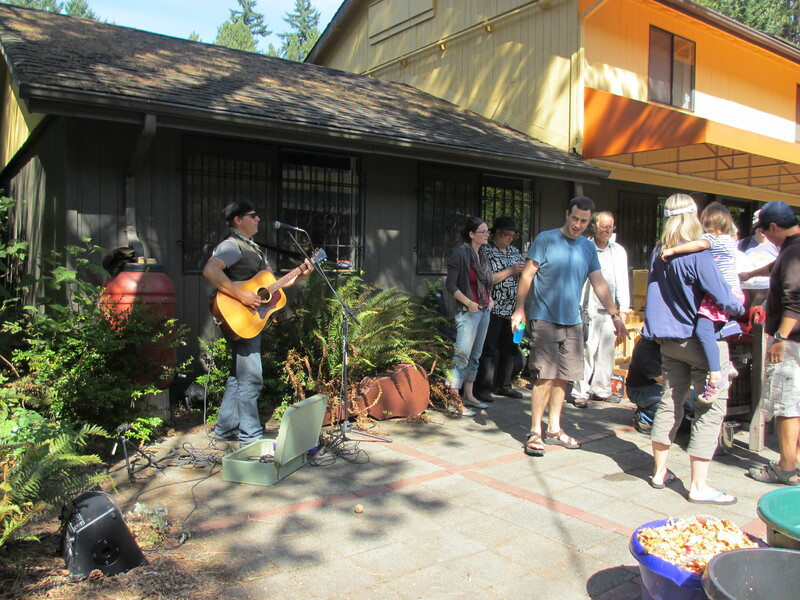 Our third annual festival was a great success, with over 220 attendees and over 20 volunteers. The sun peeked through the clouds at times, and the periodic drizzles didn’t dampen our spirits. 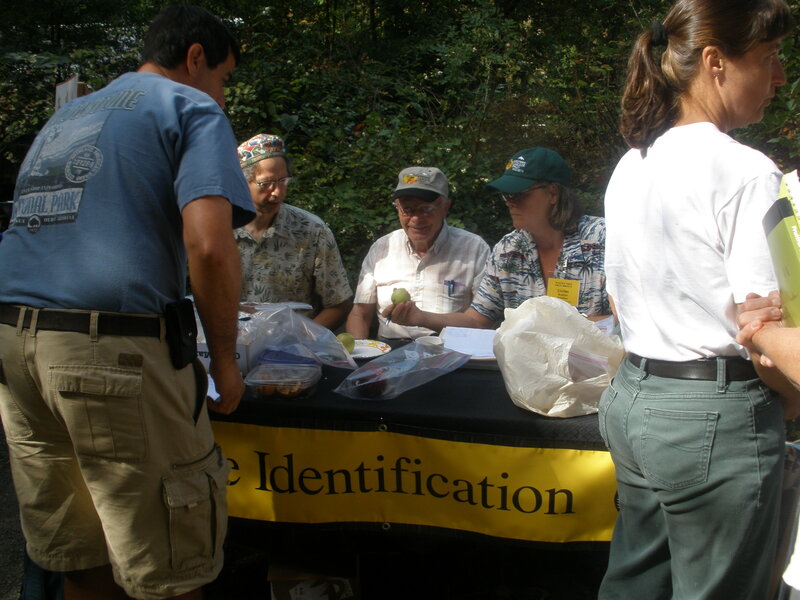 The festival took place simultaneously at the Environmental Learning Center, the Lower Meadow and the Orchard. At the ELC we had informative presentations on viticulture, organic pest management, tree pruning and espalier, and apple varieties, old and new. 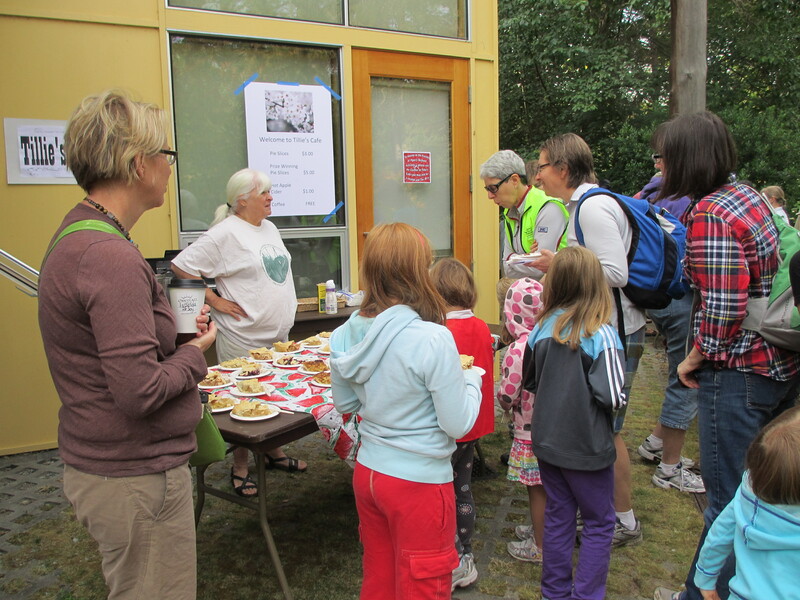 We also had booths featuring Puget Sound Beekeepers Association, City Fruit, pruning, non-toxic pest management, and orchard management, as well as a kids craft area, apple cider pressing, the pie tasting contest, and Tillie’s Cafe, selling baked treats (apple pies featured), hot dogs, coffee and cider. 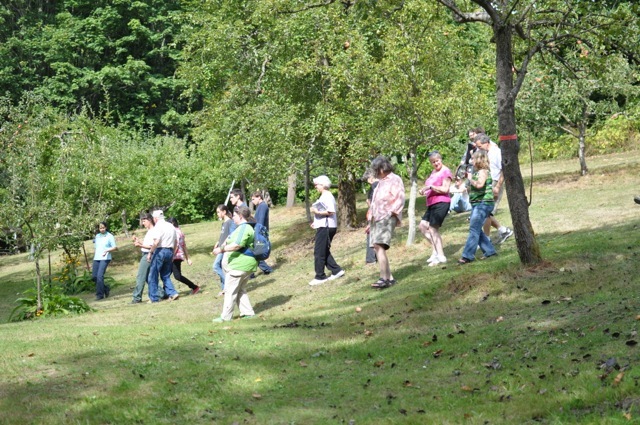 In the Lower Meadow, people were able to taste orchard apple varieties, operate the mechanical apple press, and enjoy the tunes from our wandering minstrel. Up at the Orchard, more apple variety tasting took place, and at the end of the festival, Dr. Bob Norton took attendees on a tour, discussing the varieties. We really want to thank all the volunteers and folks who attended. 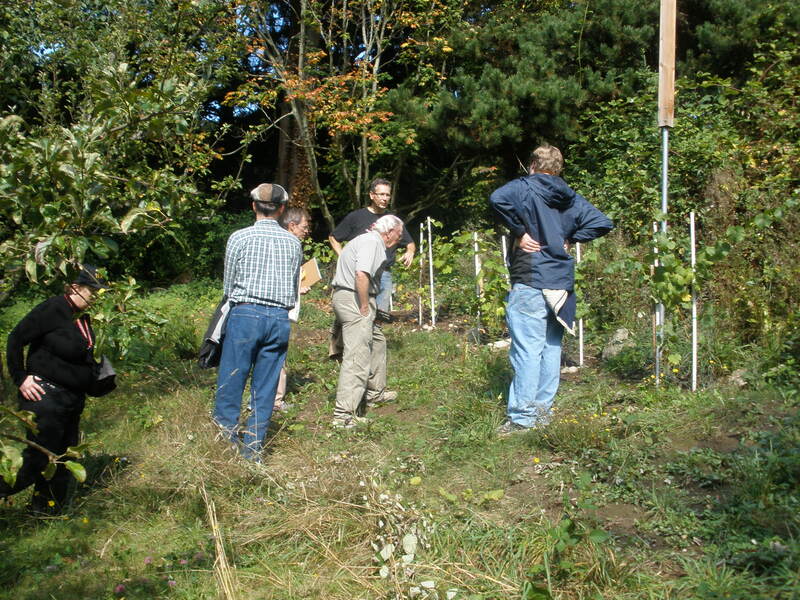 We encourage you to get involved in our upcoming orchard work parties. 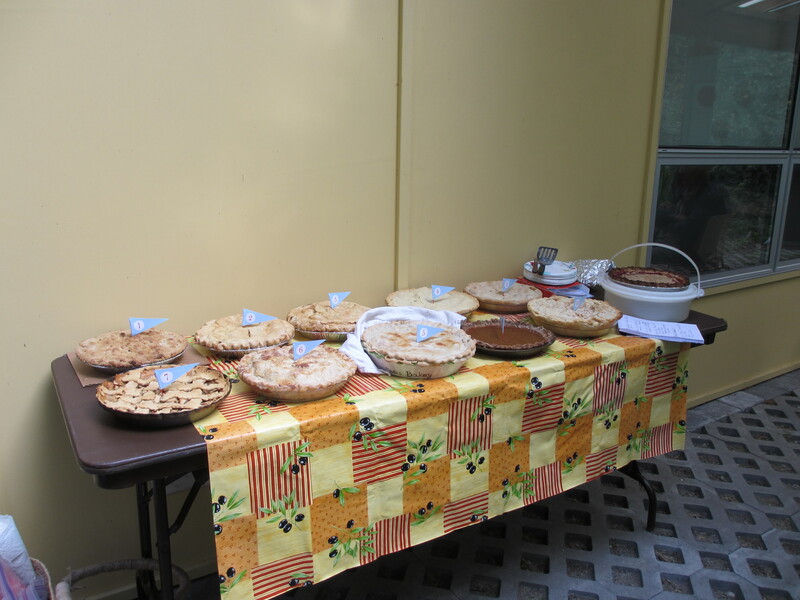 A wonderful collection of pies were submitted for the tasting contest. 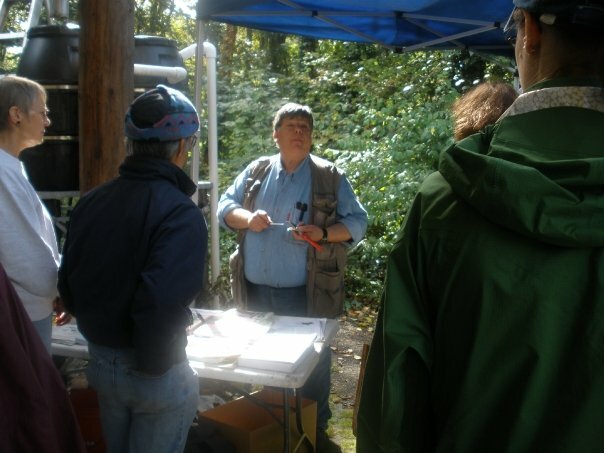 Bob Baines demonstrates tool sharpening for pruning. 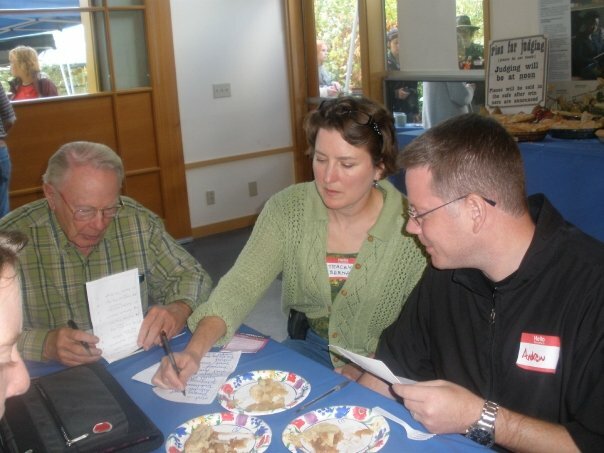 A dedicated group of volunteers (Dr. Bob Norton, Tracey Bernal and Andrew Christianson) took their pie judging duties very seriously, eventually giving every pie its own special award. Cool Moms helped keep the kids entertained. 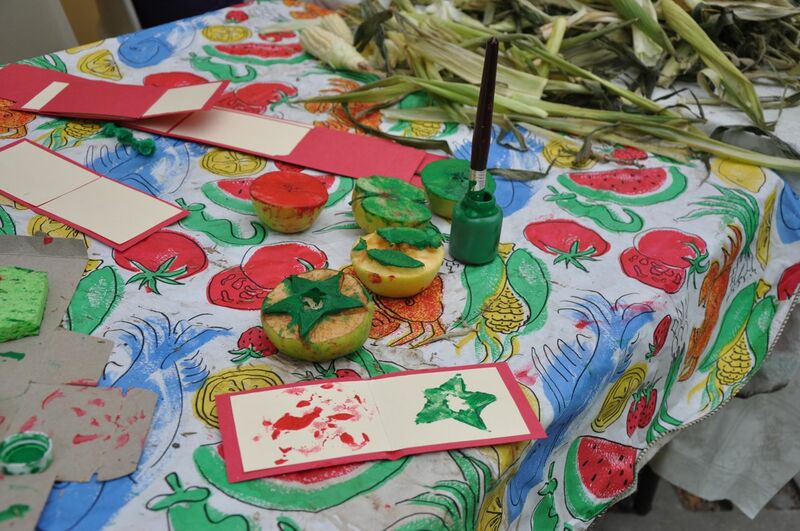 Kids made cards with stamps cut from apples. Very festive! 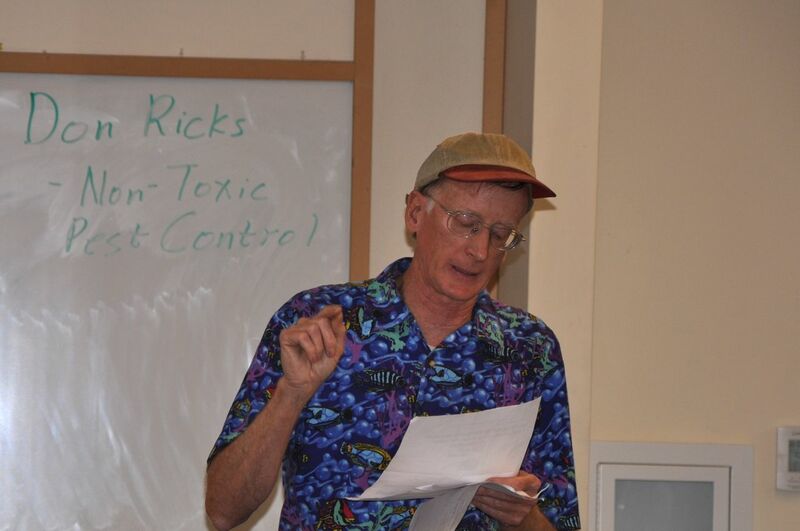 Don Ricks shared his experience with non-toxic pest management with an appreciative audience. 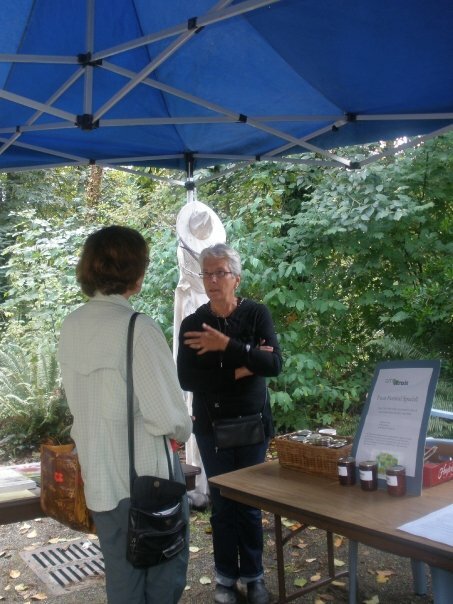 Gail Savina of City Fruit discusses gleaning and offers free fruit preserves to those who sign up. 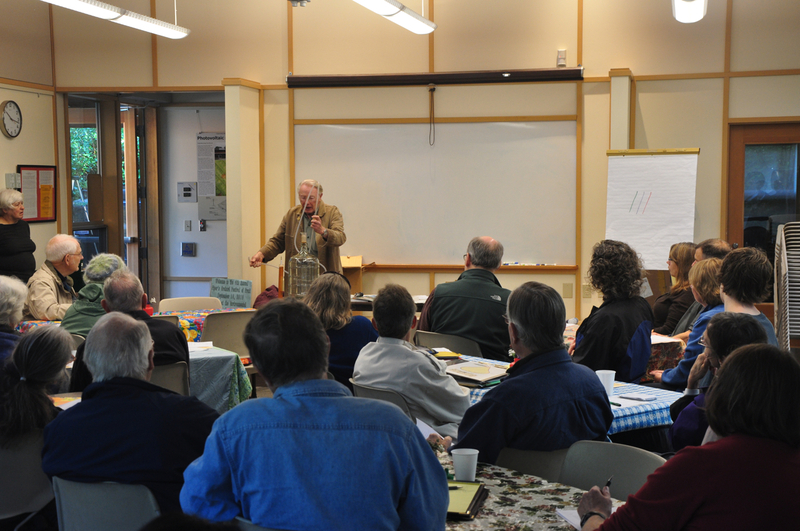 Puget Sound Beekeepers Association discussed maintenance of bee hives. 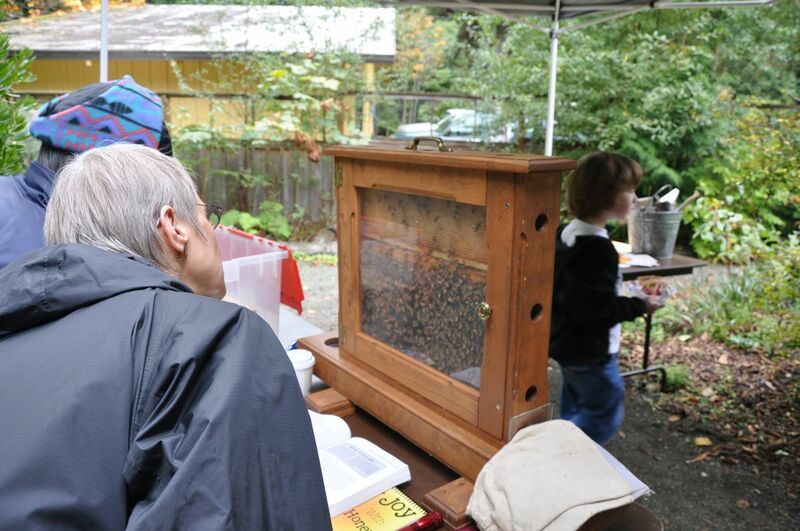 Puget Sound Beekeepers Association brought a hive with live bees (that thankfully couldn’t escape!). 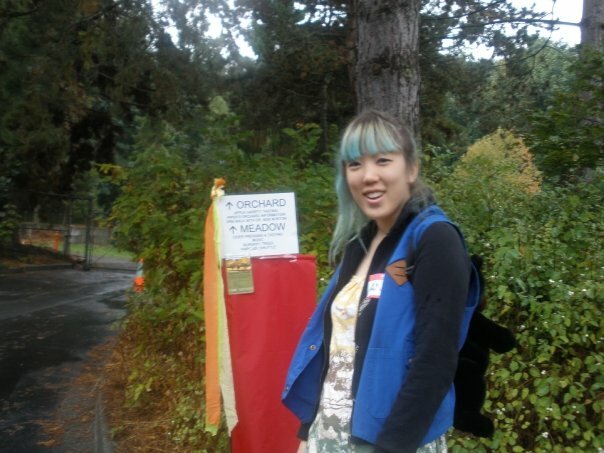 Anne Wang helps set up directional banner signs for the festival. 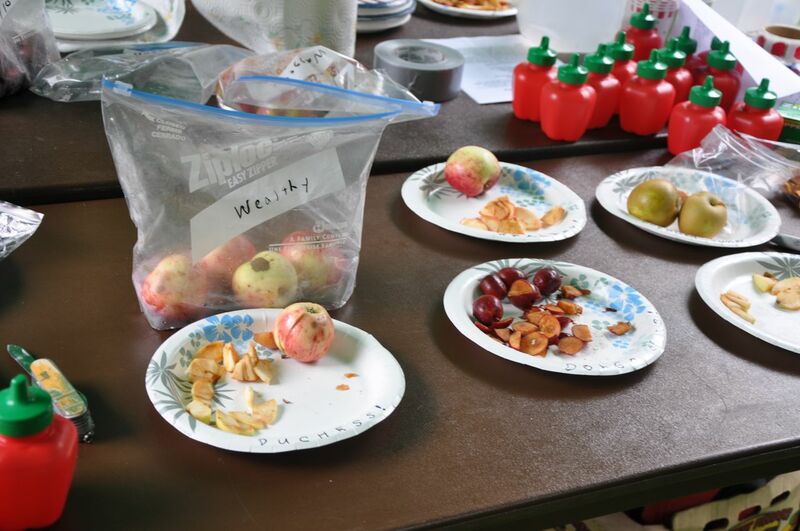 Apple varieties from the orchard were available for tasting. 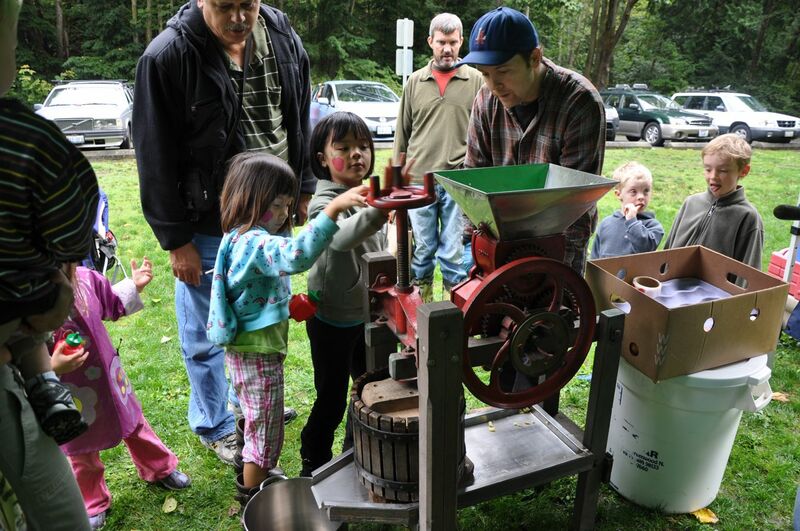 Young attendees at the festival helped press cider. Aah, after pressing the apples, the delicious fresh cider finally appears. One of our most effective natural pest management tools is foot socks on the apples. 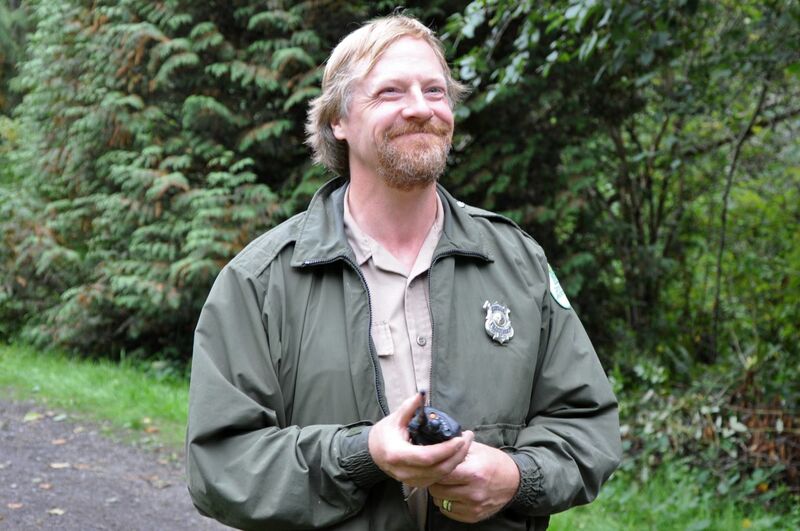 Carkeek Park Naturalist Brian Gay helped ensure the success of our Festival of Fruits. 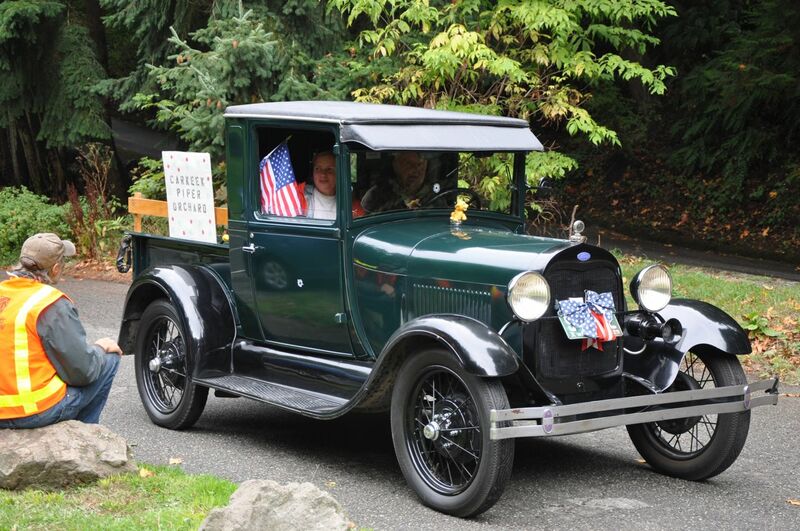 We even had a vintage auto at the festival, but some of the apple trees are older.